Fully grow adult males are 17-20 m long and weigh 40-52 tons. Females are 8-17 m long and weigh 20-38 tons. Life expectancy is 60-80 years. The body is dark grey on top, the sides are lighter in colour, and the underside is silver grey. The eyes and the flippers are relatively small and the dorsal fin is almost non-existent. Most of the 30 teeth are situated in the narrow, lower jaw, each about 20 cm long. The brain is the largest of any extant animal and weighs about 10 kg. Specialists estimate the sperm whale’s (Lat. Physeter catodon) greatest diving depth to be 3200 m, and more than two hours if necessary. Its usual dives take about 15 minutes. The head is more than a third of the whale’s length and contains great quantities of very fat oil, which may enable the whale to dive so deep. This oil probably is distributed through the body according to its positions and depth, and contains added oxygen and equalizes the pressure. Octopus is its main food, but it also eats squid and a few species of fish, such as tuna, giant skate, and shark. In Icelandic waters, it also feeds on ocean perch, lumpfish, monkfish, cod, saithe, and spotted catfish. Sperm whales usually bear marks on their heads of the constant fights with the octopus. Sperm whale males behave very differently to other species of whales in their mating. They collect a harem of 20-30 cows and watch it very carefully. They usually mate in April during the migration to the north. The gestation period is about 16 months, and the calf’s size at birth is about 4 m and one ton. It is suckled for about a year and pregnancies occur every third year. Females reach their puberty at the age of 7-13 and the males at 17-21. 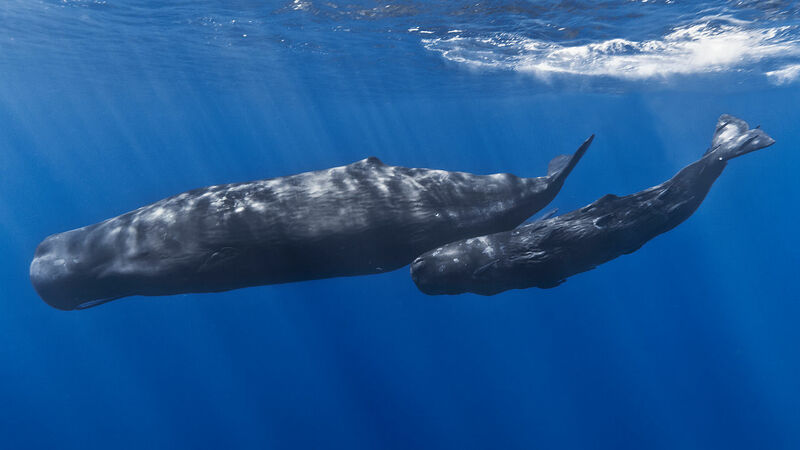 Sperm Whales are found in all oceans of the world, but it prefers warm seas. Only old or young males migrate to Icelandic waters during summer in groups of 10-20. Their total number is estimated to be 1400. The total world population is estimated 1½ – 2 millions.